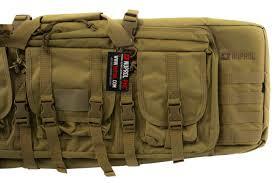 Nuprols Deluxe Soft Rifle Bag is designed to transport your airsoft weapons and equipment together. Up to two rifles can be carried in the main section which has padded outer walls to protect them from knocking against anything outside the case and also a padded divider to stop the rifles knocking against each other. Three sizes available - 36" / 42" / 46" width, 12" High. Padded main section with padded divider to securely protect two Weapons and velcro straps to hold them in place. Smaller zipped side pouch for either a SMG or equipment with two velcro closed compartments for pistols and two large zipped compartments for misc kit. Three small side pouches with velcro and buckle closing and elastic cord to secure the contents. 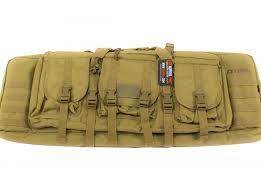 MOLLE loops at either end to customise the bag with your own pouches. Available in Black, Green, Tan & Grey..